Wooden decks are generally constructed of boards with narrow gaps between them, designed to allow rainwater to leak through. This method prevents standing water from rotting the wood, but it also means that a second-story deck makes for poor shelter during a rainstorm. If you want to be able to use the space under your deck during rainy weather, installing corrugated roofing panels to the deck's underside can solve the problem. 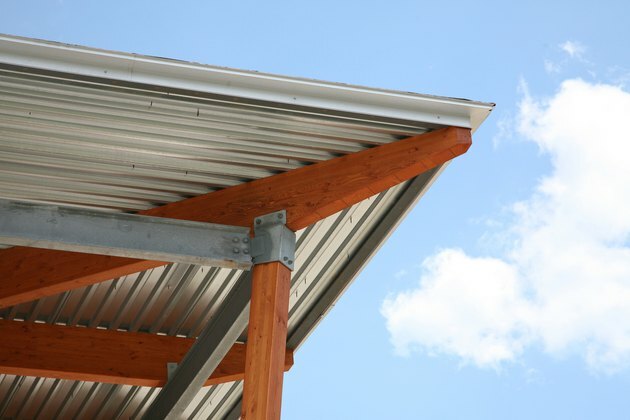 Corrugated metal panels are ideal for rainproofing outdoor sitting areas. Have an assistant hold the first corrugated panel in place against the rows of 2-by-4s on the upwind, house side of the deck. Use washered wood screws to secure the panel, driving a screw every foot along each row. Position the next panel further from the house but overlapping the first by at least 6 inches. Secure it in the same manner as the first. Install subsequent rows of panels, working your way to the downwind side of the deck's lower surface, until finished.